BISS 5.12.11 - Citizen Cope / RUBBLEBUCKET / Soulive & Lettuce / Break Science / Wavy Gravy's Bday Boogie / Make A Scene next Thursday! CITIZEN COPE also starts their three night run at the Independent on Thursday night. (Congrats to Christy!) Are Thursdays becoming the new Fridays...? Friday run around town and see a bunch of great bands....ART BREAKERS 2011 with MONOPHONICS, just fresh home from New Orleans, are at Brick & Mortar (*WIN). JeConte & his Band of Marauders is at Mojito. (*WIN) In the east bay, is the JAZZ MAFIA - STEVIE WONDER BIRTHDAY CELEBRATION. (*WIN) And yes it IS true that Stevie has shown up in the past!! On Saturday morning, you don't get to sleep in 'cause Oysterfest starts at noon featuring: Rodrigo y Gabriella, Guster, Pepper, Tea Leaf Green and The Silent Comedy. Saturday night there's lots of birthday celebrating to be done!! You can head out to the beautiful Craneway Pavillion for WAVY GRAVY'S BIRTHDAY WITH BOB WEIR, MICKEY HART, THE CHRIS ROBINSON BROTHERHOOD, ZERO, HOT BUTTERED RUM & ACE OF CUPS with special guests: Barry Sless, Barry Melton, Bobby Vega, Henry Kaiser, James Nash, Jeff Chimenti, John Molo, Mark Karan, Narada Michael Walden, Nicki Bluhm, Pete Sears & Robin Sylvester. It's sure to be a show filled with colors and giggles..........the best way to get down. Or stay in town and be present for the ROYAL FAMILY BALL (plus more birthdays to celebrate) ...with SOULIVE & LETTUCE at the Fillmore!! (*WIN) Then the late night after party is from 1:15 to 4:15 with BREAK SCIENCE feat. 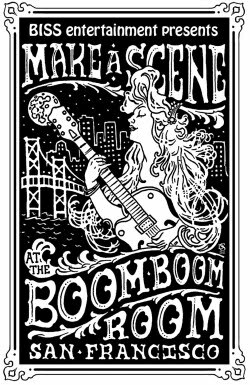 Adam Deitch & Borahm Lee at the Boom Boom Room. Congrats & Happy Birthday to Andi!! Sunny is getting her tiara ready. Remember if you rest, you just get tired......so keep going BISS Listers!! Cause if you ain't skurrred of a little corralling & the prospect of being thrown in the drunk tank, you might be partying early on Sunday from the Bay to the Breakers!! What's YOUR theme??!! If you decide to sleep in, get up in time to get to the Pig Roast at The Chop Bar in Oakland at 5pm featuring Markstep Trio. MAKE A SCENE on Thursday night featuring MAMA'S COOKIN, SEAN LEAHY TRIO, M80 Mailbox (members of Tea Leaf Green & ALO) & Joe Tatton of New Mastersounds!! Over the last few months, Make A Scene has developed into being a monthly highlight for the BISS crew. Come out and find out what being a part of the BISS family is all about. WE GET DOWN......we hope you join us! And in case you missed it last week, Happy Birthday to Andi, Dave, Jen, Jordan, Shar, Michele, Matt, Sam, Robin, Fancy, Dina, Leslie, Patty, Mike, Dianna, Linda, Steve, Jesse, Wavy, Michael Kang & my Dad too!! if you are interested in participating please send an e mail to ronkatmanagement@yahoo.com and we'll answer any questions and send you more information.